Slavery … loyalty. Torture … honor. Betrayal … selflessness. All the young orphan wanted was security in a world that destroyed her family and left her despised and rejected. Can the simple farm girl find a new family through voluntary enslavement to the duke’s household? Crafted in a highly precise writing style so smooth it slips right from the page into your imagination, this fantastical storyworld examines timeless social issues that inform global justice today. Book 1 of The Ascendancy Trilogy series, fantasy for adult readers. What is the purpose of a novel? Is it merely to entertain? Should it make the reader think? 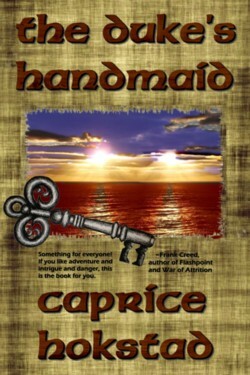 What if it does a beautiful job of balancing both?The Duke’s Handmaid by Caprice Hokstad tells the story of Keedrina, an “Itzi”–a people seen as inferior and ignorant by the reigning race, the “Elva.” She is a simple farm girl, living the life society dictates for her race…with one exception: Keedrina’s appearance is unusual for an Itzi and she is able to pass herself off as Elva in order to learn to read.Why does she do this? She knows she’ll have no opportunity to use this skill in her present life…But her life is destined to change.Keedrina loses everything and is forced to make a choice in order to survive: either continue to scrape buy, nearly starving and alone, or give up the one thing she has–her freedom–in order to gain life through slavery. A paradox? You’ll have to read to find out.The Duke’s Handmaid is a smoothly written and beautiful story, and offers opportunity to ponder much about the true meaning of life and love at the same time. With depth of character, action, and a unique and vivid world, The Duke’s Handmaid captured both my heart and my mind. 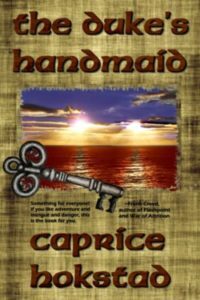 The Duke’s Handmaid by Caprice Hokstad is a romance in a fantasy setting, with a bit of a fetish twist. Keedrina is a Itzi peasant, considered dull and stupid by the ruling class of Elva. But she’s smart and has learned to read and stuff. When her mother and sisters are brutally murdered, the Duke takes her into his house until she recovers and decides how to make a living. Keedrina opts to sell herself into slavery to the Duke, who treats slaves kindly. Over the course of the story, Keedrina’s love and loyalty to the Duke help her uncover a traitorous plot to kill the Duke and the King. The fantasy setting is good, but not overly done. There is magic, but only mages do it. There are two suns, two moons, and two races. The rest of the details are like Middle Ages Europe, and satisfyingly consistent. But there is a weirdness to this story. Keedrina’s worship of the Duke Vahn pretty much starts when she sees him stroking another slave’s hair. She wants him to stroke her hair. So she falls at his feet and worships him. Constantly. She’s perfectly submissive 100% of the time. She takes the heat for other slaves’ mistakes and never makes any of her own. Her loyalty never wavers. Uh … yeah, okay. It was a good story, otherwise. But I lost sympathy with Kee about halfway along. She was like a robot because her actions were so predictable.